My name badge from the 2012 (and final) Lyra Imaging Symposium - a potential collector's item? It’s late January, mid-week in the afternoon, and here I sit in Boise, ID. The weather outside is seemingly doing us a favor by allowing the temperature to ease up into the high teens – yippee! What’s wrong with this picture? Well, one thing that’s wrong is the location. 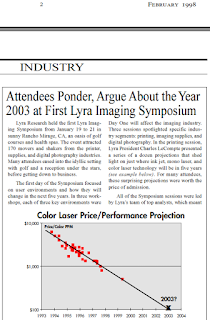 About this time every year, since the late 1990’s, a multi-day event called the Lyra Research Imaging Symposium has taken place in the Southern California desert. The Rancho Mirage location (adjacent to Palm Springs) was consistent every year as was the late-January timing – just before the Super Bowl, and usually sometime during the Sundance Film Festival, two other events often on my radar. 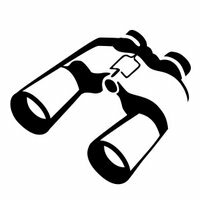 But times change, as we all know, and Photizo’s acquisition of Lyra last year led to some conference consolidation (see "January 2012 Observations: Looking Ahead and Enjoying Coming Full Circle in the Research/Analyst World"). The combined energies of the new organization are focused on the May and October “Transform” events, rightly so. But I am finding out I dearly miss Rancho Mirage this time of the year. By the end of the Symposium’s 15+ year run in 2012, I had attended almost every one. 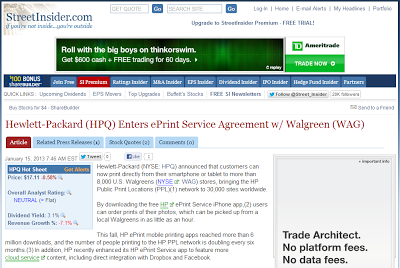 I first attended as a client when I was working with HP in 1998, the kick-off year. 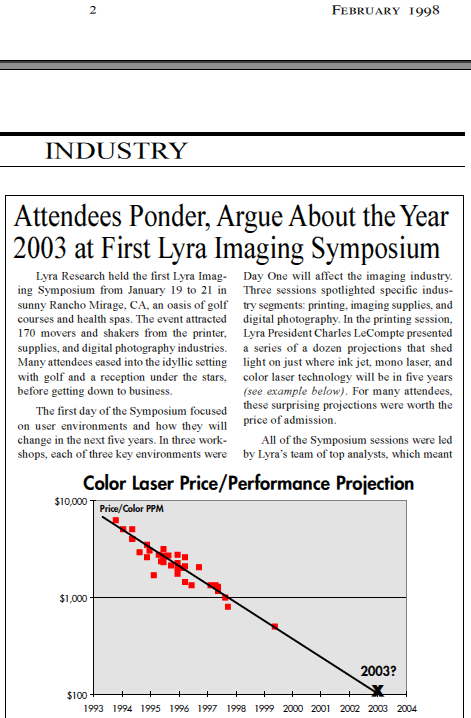 In 2006, I attended from the “sponsor” side, as a friend of Lyra and contributor of this blog. Finally, I attended as a staffer of first Lyra and then Photizo, following the acquisition. I missed two of them during that first portion (when other travel took priority) but hit them all since. From the HP side, I have some great business-related memories of the Symposium (it’s NOT all just about the nice weather)! We, as a company, were represented by many attendees (and speakers) over the years, and depending on business conditions, travel restrictions, and the like, the turnout could vary greatly. When throngs showed up (one year I remember 30 HP attendees), I could mentally justify it based on the company’s tremendous breadth in the industry. Topics on the agenda would regularly include office and home printing, ink jet and laser technologies, photo printing, wide-format and industrial applications, and hardware and supplies, and each of those categories found HP as a major player. The product managers, designers and developers, forecasters, and the like all belonged at an important annual conference where trends and other developments were being discussed. HP’s “silo” approach to its organization also leads to very focused information-gathering activities, meaning more specialists who turn out for a conference. But when travel cutbacks were enacted, conferences often became the first casualties, as (it was rationalized) valuable market intelligence was available in other forms that could be accessed without traveling, at least temporarily. One year, during one of these travel freezes, I was able to attend based on a pre-paid registration and an understanding boss. I was the only HP attendee, with the exception of Vyomesh Joshi (VJ), head executive for HP’s printing and imaging group and keynote speaker for the conference. I found myself, as part of my presence and knowledge of the business as well as the comfort-level based on my long-time relationship with VJ, as the PR “baby sitter” at his post-presentation analyst briefings, but fortunately (for me), there were only a few scheduled, as this role, despite the disparaging label, actually carries great responsibility. I remember the duty was pleasant, if a bit nerve-wracking, and not too taxing (though I was impressed that VJ seemed to know more about just about everything than me, his would-be “detail” guy). I also remember that one of the interviewers was Shannon Cross, well-known Wall Street analyst who was also a Symposium regular. I got to know her for the first time as a result of that duty. Fortunately, VJ did not become victim of the Symposium’s “Curse of the Bambino.” Patterned after the “real” curse, that involves the Boston Red Sox and their trade of Babe Ruth to the New York Yankees and the decades-long World Series drought suffered by the Bean-towners as a purported consequence, Lyra’s Symposium keynoters were known for not holding their jobs for much longer after their speeches. 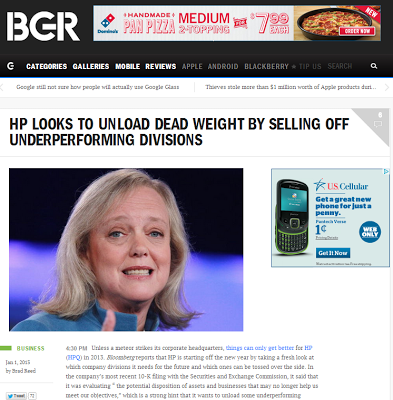 Richard Thoman, CEO of Xerox (ousted by his board shortly after his 1999 speech), and Carolyn Ticknor, head of HP’s Imaging and Printing group (and replaced by VJ himself shortly after the Symposium in 2001), were two I remember. (Carolyn, also a long-time friend, was keynoter during one of those two years I missed.) But the Symposium-related CEO ousting I remember best, however, is when HP’s Carly Fiorina, who by the time of the 2005 Symposium had worn out her welcome with virtually every HP stakeholder imaginable, saw her imminent demise (coincidentally) leaked to the Wall Street Journal during the conference, my last one as an HP employee. My years on the “sponsor” side are replete with highlights as well. The one that most comes to mind was when former Lyra marketing manager André Rebelo decided the Symposium needed an “official conference blogger” and that I, veteran of a couple of years of independent blogging in addition to contributing to Lyra’s Hard Copy Observer, should fill that role. It was a thrill to post information during and after the conference at this very blog site (jimlyonsobservations.blogspot.com). As other bloggers joined in the fun, we also saw social media evolve, with “tweets” taking over the day and dominating at recent events. By 2012, over a dozen social media activists tweeted at least a few times from the Lyra Symposium audience, and it was a pleasure to be in on the start of that trend, thanks to André (though actually I was already blogging the conference, when I think about it, but it was his flair for titles like “Official Conference Blogger” that added to the momentum). Well, I will get by! By the time I am wrapping up this post, Boise’s come out of the deep freeze a bit and days are noticeably longer all the time. No Rancho Mirage this year, but I must get back to the desert soon! Jim is senior contributor on the Future of Printing for Photizo and authors this monthly Observations column for the Imaging Observer 360. He also blogs and tweets on developments in the printer industry. In addition, Jim is a faculty member at the University of Phoenix, teaching marketing and economics in the school’s MBA program. Past columns, links, and other musings may be found at www.jimlyonsobservations.com. Follow Jim on Twitter, @jflyons. 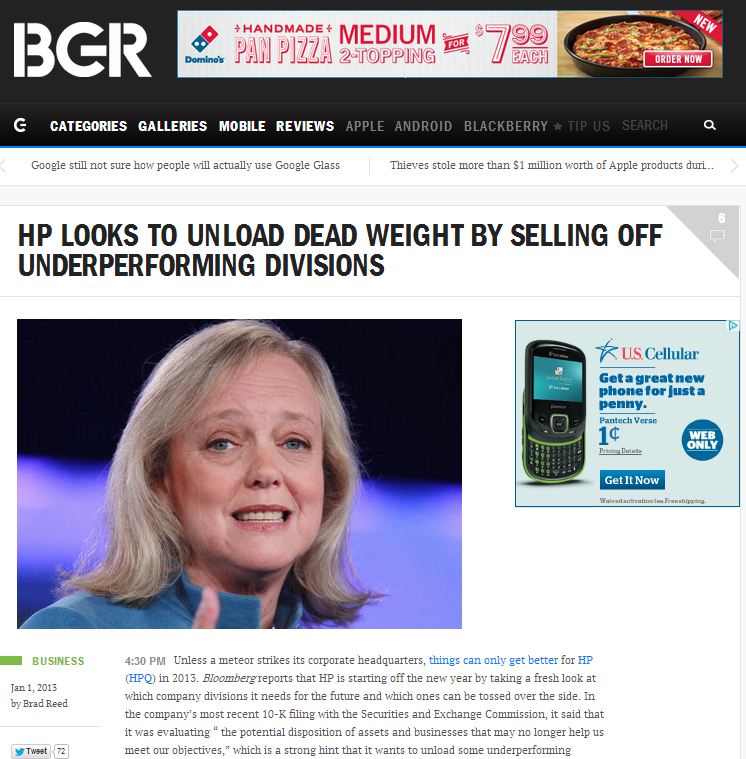 Pardon the sports metaphor in my headline today, but it seems that, at least from an HP printing and imaging perspective, the phrasing "Interesting HP developments - on and off the field" sums up this week perfectly for the Palo Alto, CA-based tech giant. 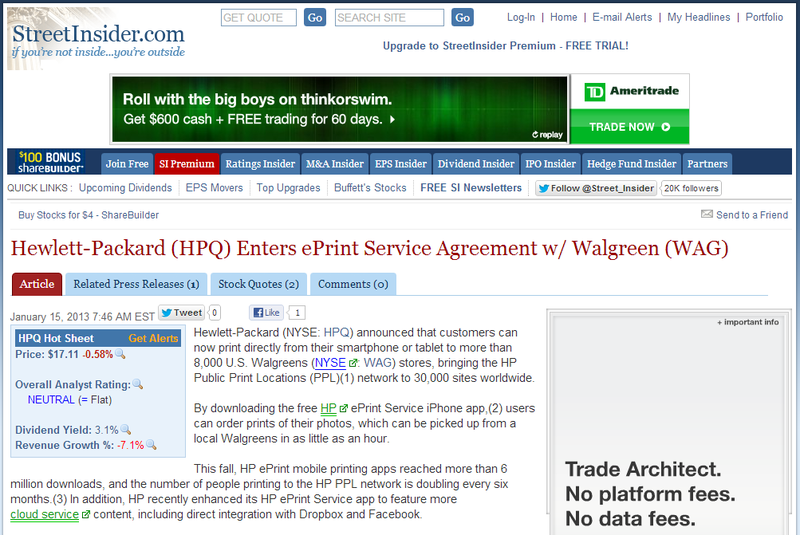 Since I wrote my December Observations about the potential of seeing an independent "HP Printing Company" (see Spin-off Spinning) in 2013, MUCH has been discussed about the company and its potential plans to shed business units, lest others take on the job for them. And the stock has responded - from the time of my December column, with the stock languishing in the $12-and-change range, $HPQ has been generally "up and to the right", closing today at $17.11. And the sports metaphor about on-and-off-the-field stories holds further. As is in the world of sports, and just like in this post, it's the "off the field" stories which capture the top position! The first was this from Venture Beat, in an article by Meghan Kelly about Polaroid's new Fotobars (see "Polaroid ‘Fotobars’ print Instagram pics on metal, wood, and other materials"). Kelly's article is upbeat and a fun read, as she plays off her apprehension about something like this possibly being "cool and hip". The retail outlets begin opening in February, per the article, and I look forward to visiting one in 2013 - their short list of planned stores doesn't include Boise (surprise!) but of the four locations mentioned (Delray Beach, Fla., New York, Las Vegas, and Boston), I should be around one of them in the coming 12 months. The second was even a little less related to my overall printer/printing beat, but covered a device I have long been fascinating by (going back to boyhood days and autograph collecting). It sprouted out of the bill signing required for the so-called Fiscal Cliff deal, finalized by a vote of the United States House of Representatives on the evening of the 1st, and "signed" by President Obama sometime shortly thereafter. In "10 facts about the ‘autopen’", Politico writer Kevin Cirilli shares some fascinating history about this signature-generating device. This includes item #7, which begins with "It’s more personal than a printer" - and which should provoke at least some readers out there to click through and learn more! But Fiscal Cliff and Politico? I better stop while I am ahead, and start planning my busy work day for Friday the 4th!